Well, it has been badass. I could write reams and reams about the events of the last two weeks but I am afraid I do not have the time and must settle for a quick synopsis and a few pictures. I sadly left Samphire in Roatan where Paul and Twyla are working charters (Charter them! 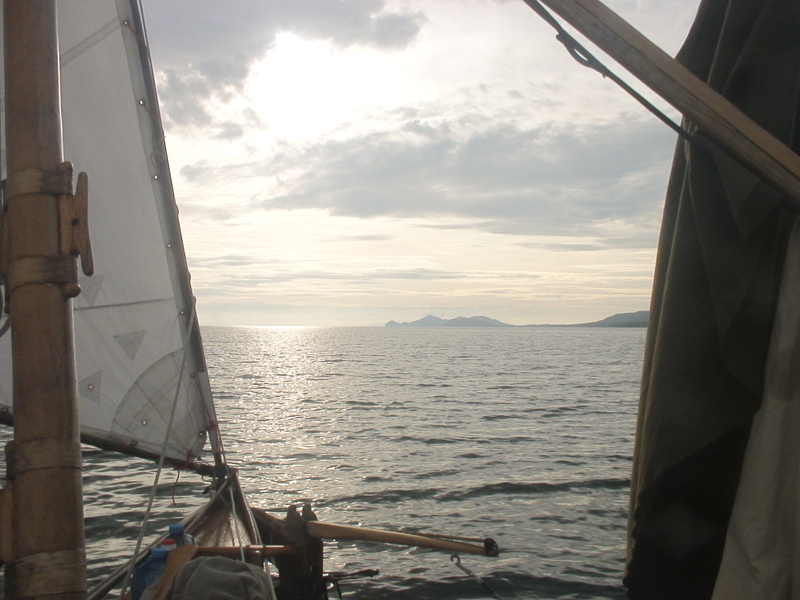 http://www.samphire.ca), sailed on a freak westerly (fallout from a hurricane near Mexico I am told) along to the eastern tip of the island, the next day onwards past the island of Barbareta to land at Guanaja where the rain, heretofore not too bad, started in earnest. I spent the next day trying to stay dry in the shelter and failing – water gets in around the bottom and the bedding being very salty like everything else absorbs water straight from the air. The following day I took a chance and sailed for the mainland, hoping to make a long run to the southeast and fetch up at Rio Patuca, but the weather turned nasty and I had a horrible trip, didn´t think I would make it and swore I would never sail again but once I had at last crossed a crazy bar and entered a rivermouth at Santa Rosa de Aguan I was euphoric and soon forgot the horrors. Santa Rosa is a Garifuna village, not particularly hospitable but not unfriendly and I obtained some much needed hot foot and sleep. 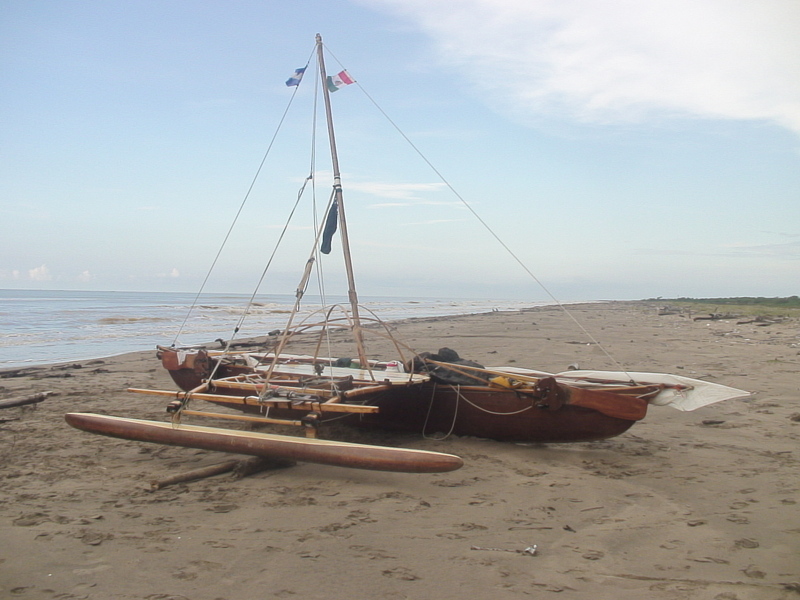 The next day shaped up to another westerly and with a strong following wind I made a good 70 miles eastwards down the coast, crossing another bar and landing at the Miskito village of Platano. This was my first encounter with the Miskito. I find them mostly pretty smart cookies, adaptable and intensely curious about me and my vessel, though there is the usual sprinkling of half-wits and smelly slobs amongst them. 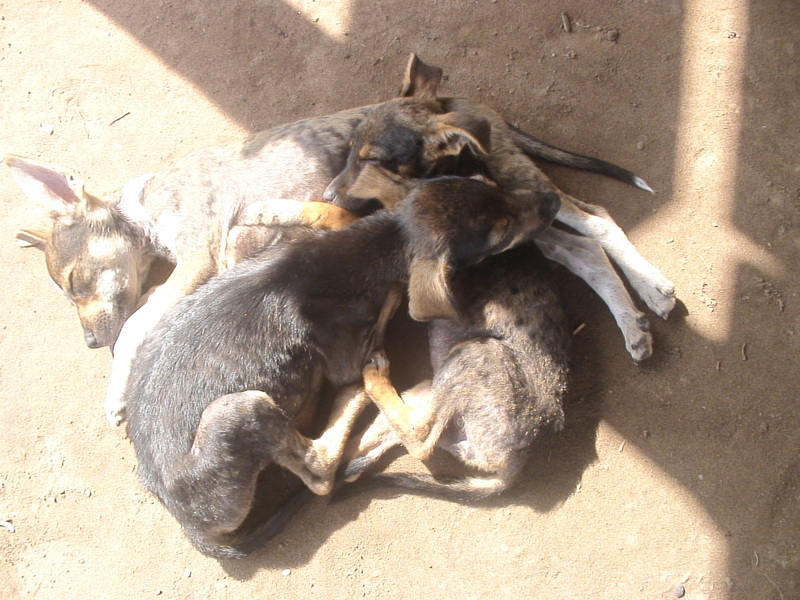 They gather in groups and watch my every move for hours and hours – how they linger! – which I find a bit difficult to bear after a while but have to be as pleasant as I can be. At Platano they fed me and would not take payment though I left them with some of my own supplies. They also steal, it is a huge problem along here and I have to guard my stuff very carefully, all the time. Even being careful I lost my sunglasses and my precious deck knife which I have carried from Veracruz and never dropped overboard once. Onwards the next day, only half a day´s sailing before the wind changed abruptly from almost nothing to a good 25 knots and forced me to land. As I work my way along, tacking into the wind, one thundersquall after another bullies its way down the coast and the winds that come with these are overwhelming. I must drop sail and drift, or reef and fight on carefully. It is not fun. I landed a mile or two short of Rio Patuca. A night on the beach, then pretty much the same experience the next day to land at the tiny settlement of Flor de Uva, The Miskito here very likeable and they fed me quite a few meals over the next few days (red beans, rice, plantains, yuca, armadillo) as the wind howled nonstop and the rain blasted horizontally along the beach. They speak Miskito, I have been learning some which goes down well, and many speak Spanish also so communication is not a problem. So much to tell about my time here but I cannot. Another half day to Uhi, a huge audience at this village, rather tiresome. Onwards from there the next day to the great Carratasca Bar at the entrance to the huge Carratasca Lagoon. Crossing this bar was one of the most exciting things I have ever done, chrging through the best part of a mile of running surf over unfamiliar sandy shoals to finally enter the calm within the lagoon mouth proper. 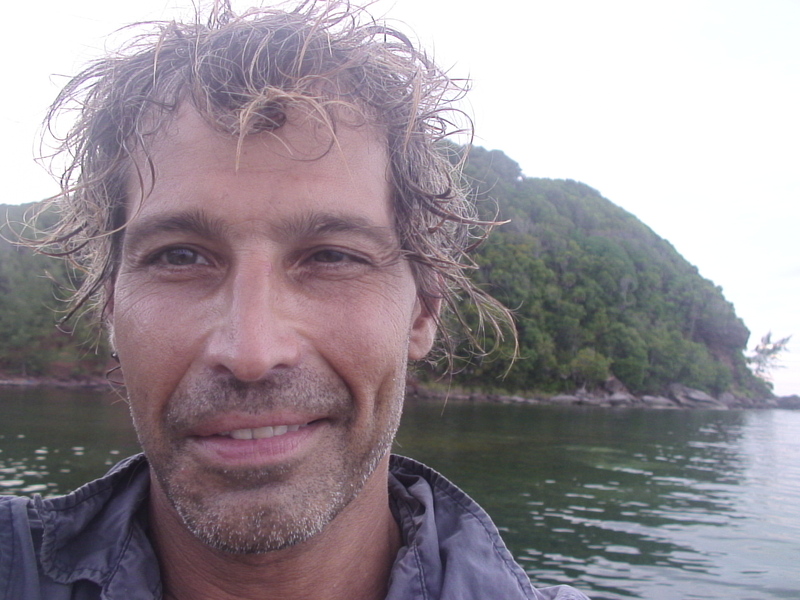 Thence after checking in at the military post across the lagoon to Puerto Lempira where I sit writing this whilst mosquitoes bite my feet. Here are some photos. There were a bunch more but I am having problems uploading them and am out of time. 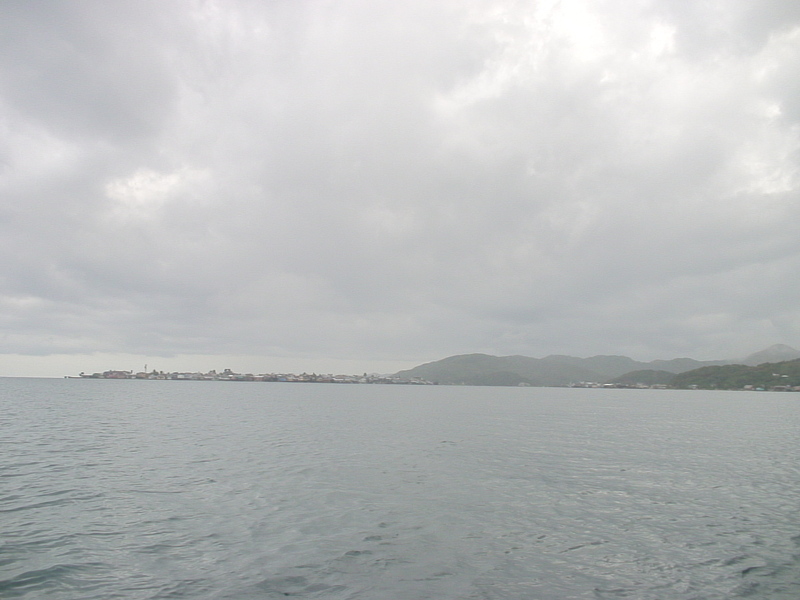 I think that´s Barbareta and Guanaja up ahead. Early morning by the east end of Roatan. 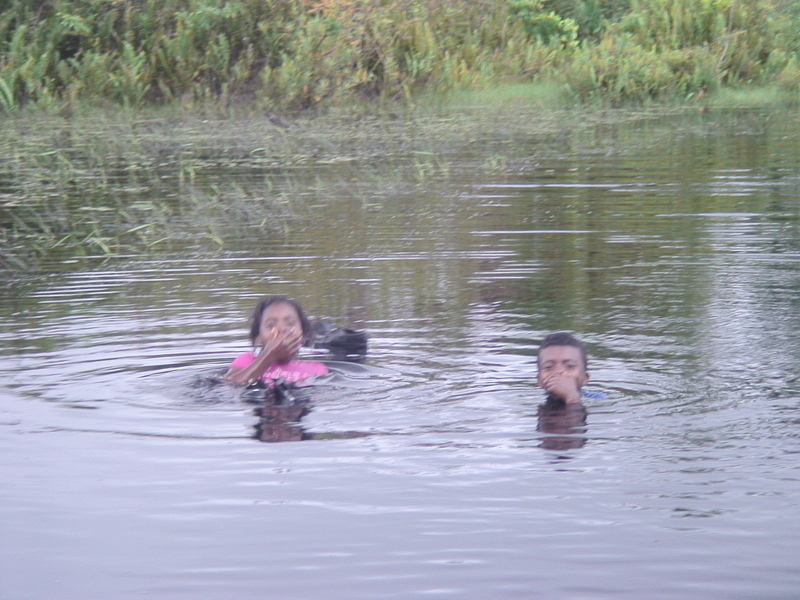 In Guanaja, whether on the mountainside or over the water, everything is on legs. Note the lovely weather. 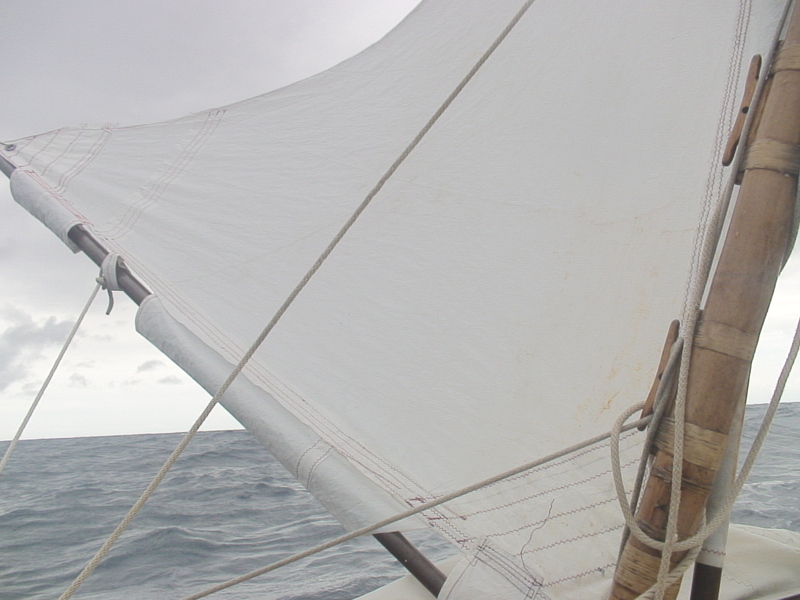 During the grim crossing from Guanaja to the mainland I managed to jury-rig my tiny storm sail for the first time. This is the only photo I managed to take. The sail worked to an extent, giving me steerage bu tnot enough speed to reach the coast before dark so I went back to the big sail, reefed. 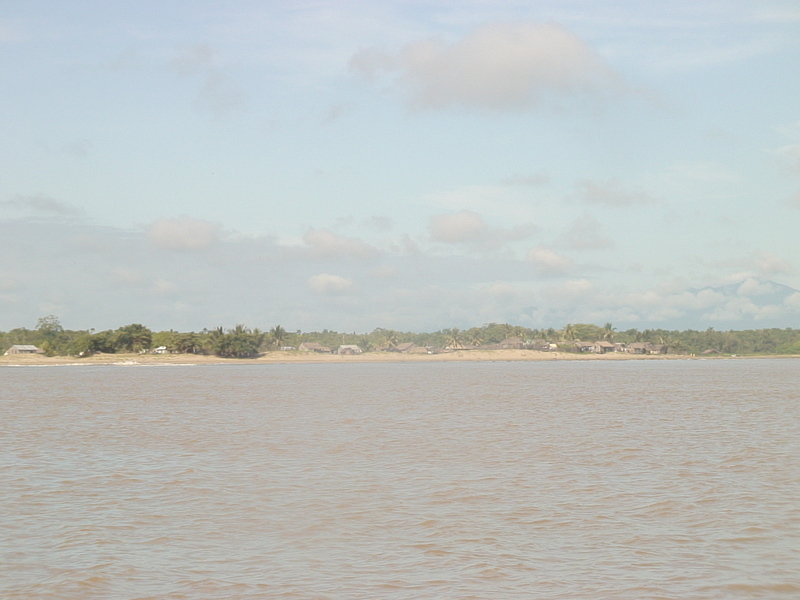 Now that I have left the mountains behind the coast of La Mosquitia looks like this, though this bit has the village of Platano at the mouth of the Rio Platano on it. Behind the first barrier of dune the land is flat and is covered in low, almost impenetrable swampy jungle, largely flooded at the moment. 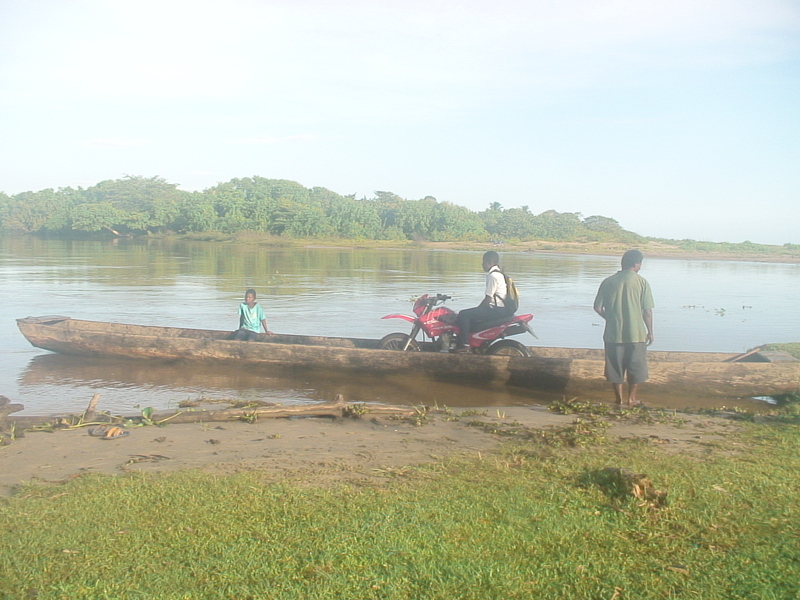 The Miskito use these amazingly long river boats called pipantes. This one is a pure single-tree dugout. 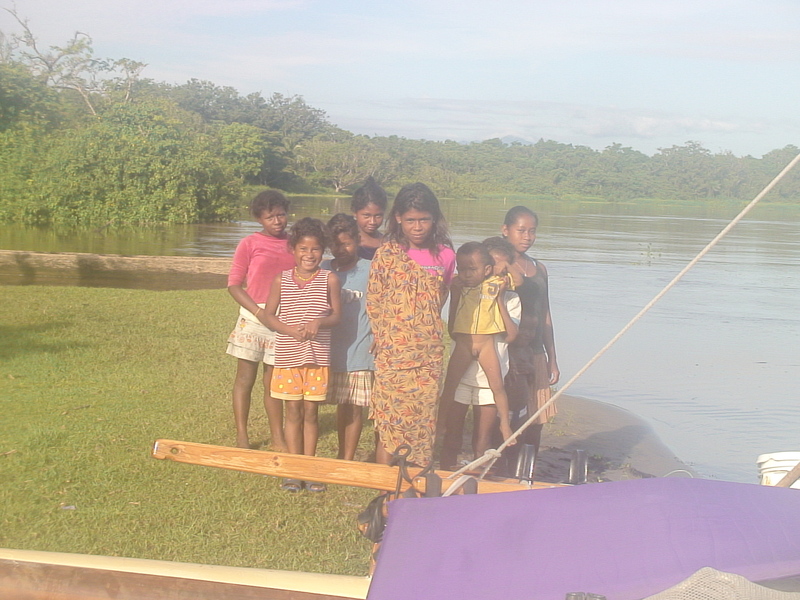 Miskito kids. Cute, adorable. I was having wet camera problems, hence the mist. Rio Platano. Standard beach stop for Desesperado. One mile south of Rio Patuca. Agara, 19 and Yanira, 22, appeared near Patuca and rather threw themselves at me, to which overtures I feigned obliviousness. I´ve been getting this a lot; it is not easy being me you know. We had a good time around the fire though; I fed them as I fed quite a few people. The Miskito also fed me. 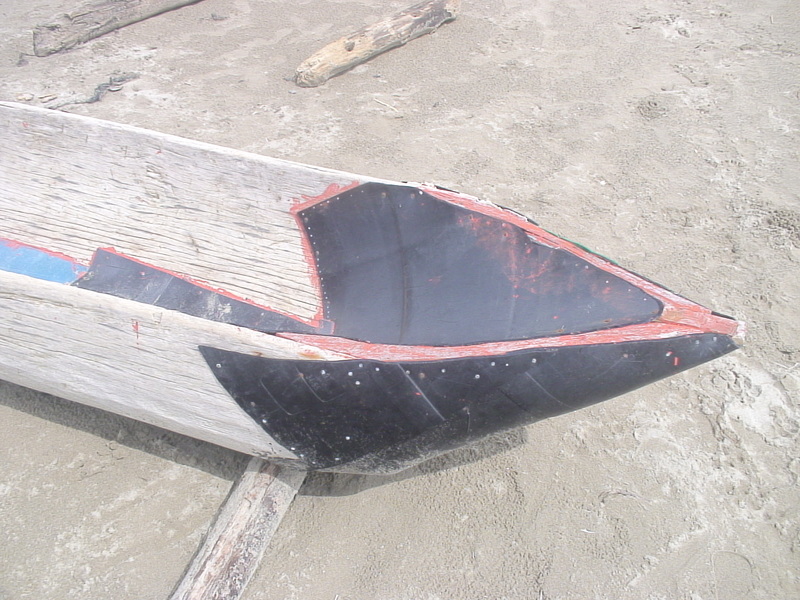 Nels´ cayuco, soundly repaired with galvanized nails and various kinds of plastic washed up on the beach. Bobmarley and Melanie. it is so easy to fall in love with these kids. This is taken on a pathway, believe it or not, and it was not even officially rainy season yet. It is now. View from inside the asphalt shack down the rain-lashed beach. How it rains here! I was rained and galed in at this spot near the tiny Miskito settlement of Flor de Uva for five days, spending a good deal of that time on my wet bed, bracing hands and feet against the inward-bulging sides of my shelter whilst gusts tried to tear it away. There has been very little pleasant weather in the last two or three weeks. 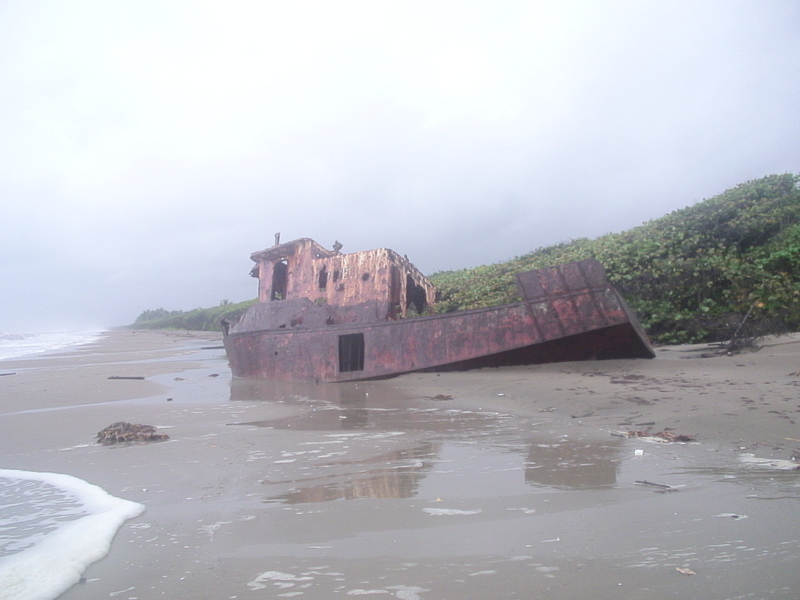 This fishing vessel was wrecked here on this remote stretch of beach some years ago. 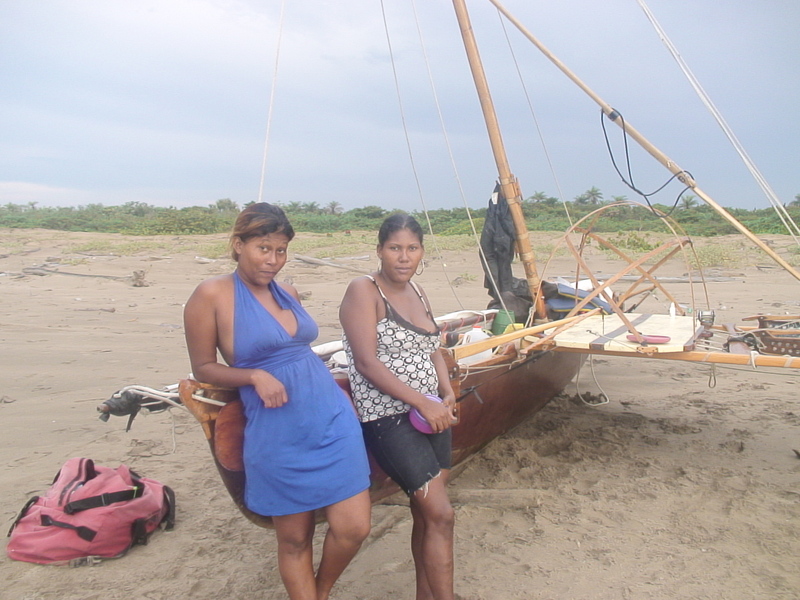 Its crew of escaped Cubans happily ran off down the beach and made it to La Ceiba. I am told that Cubans are not pursued and deported from Honduras. 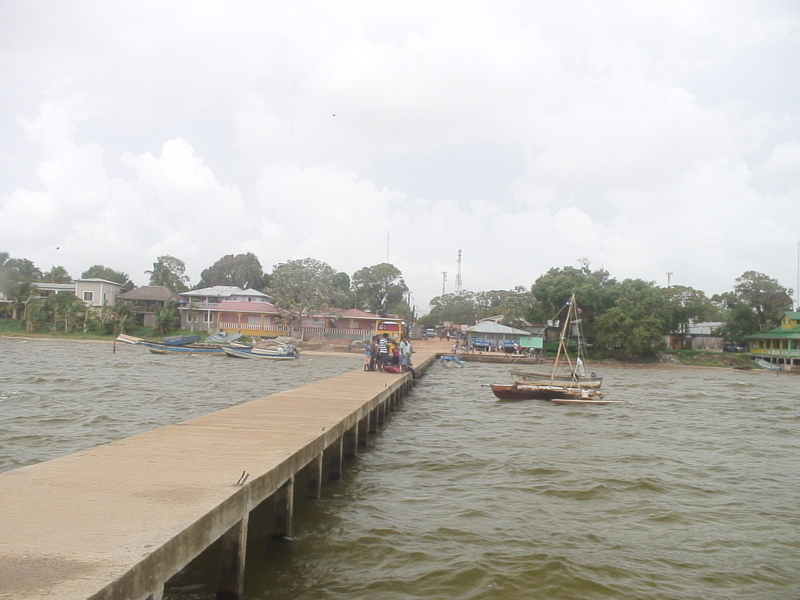 Puerto Lempira. The usual gathering stands by Desesperado. 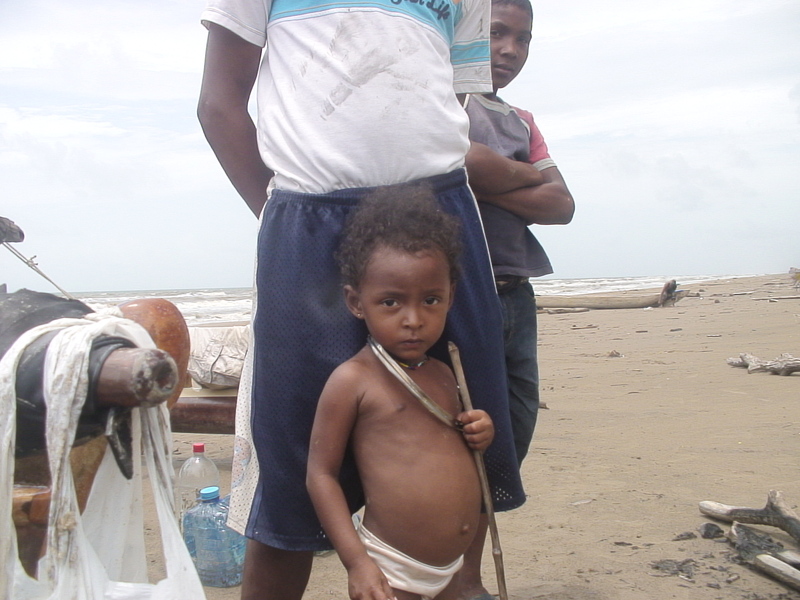 Lempira has dirt streets and a mixed population of Miskito, Latins and Garifuna. I am constantly pestered by drunks wanting money and offering their pimping services. Hair? What´s wrong with my hair? I am now ready to leave Lempira within the hour. 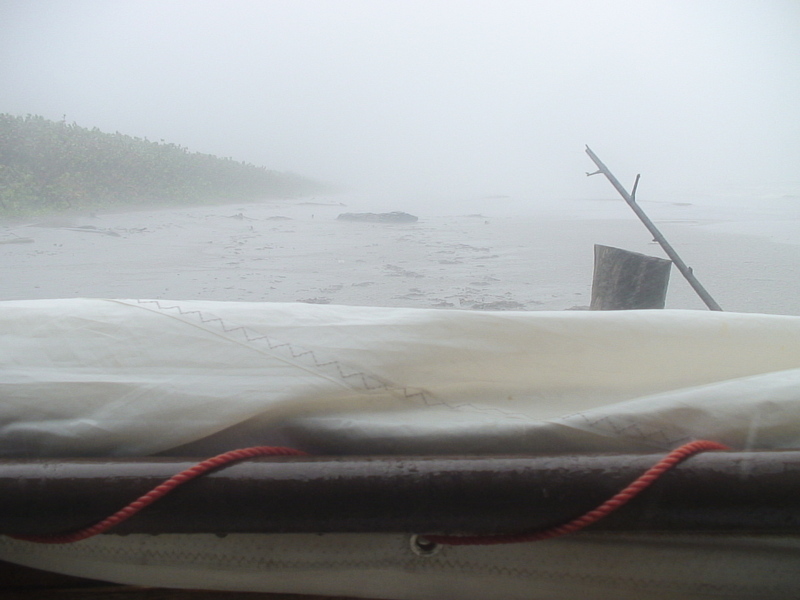 I must cross the lagoon and then the bar against the waves, then make a right turn for Cabo Gracias a Dios and Nicaragua, about whose coastal inhabitants I have received a disturbing number of dire warnings. However it is always like this – every village thinks the next village down is evil. Next stop with internet service – Puerto Cabezas Nicaragua. I will try to add to this post there if computer time is cheap. well, chris, once again i am enthralled with your post and the adventures that inspired it. my homesteading on holbox and solferino pale in comparision. you rock! safe travels and keep us posted on your travels! Great update mate and thanks for the news. You’d pay a fortune for a hairdo like that in this part of the world. May Hughie (the wind God, in Australia at least) smile on you, and blow the rain off somewhere else.